Tell us about the proposal! Ryan took me to Vilamoura in Portugal for my birthday. On our 1st night on our hotel balcony overlooking the harbour, he got down on one knee and asked me the question, I said yes of course – but only after checking that he had asked my dad’s permission!! 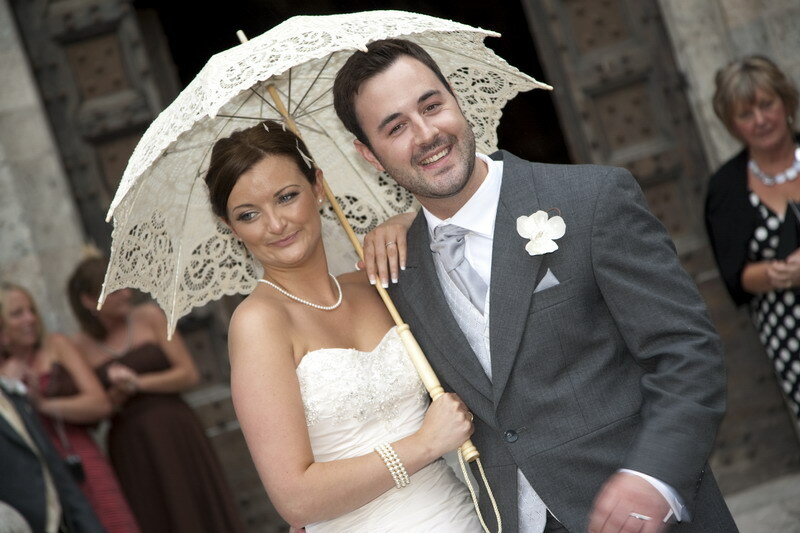 Wedding date (and why you chose it): July 11, 2012 – Because we wanted a summer wedding before the School holidays and it normally has very little rain (unlike in the UK!!) – average temperatures are in the 30s. Why did the venue appeal to you? 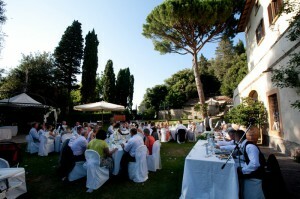 It was important to us to be able to have the ceremony in the grounds of the Villa in such a beautiful location. 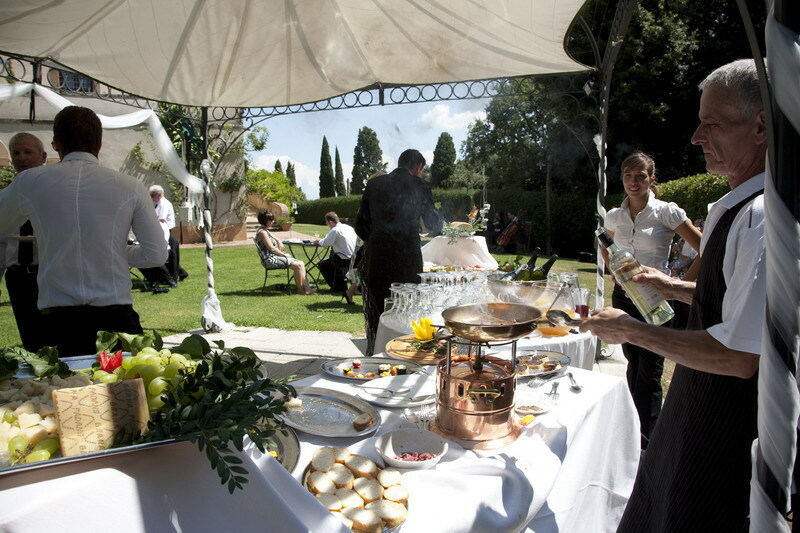 The restaurant just outside the grounds was also very handy for all of our guests during there stay. It was also great that our guests could stay in apartments surrounding the main Villa. What did you think of the job that Erica and Nicoletta did and were you pleased with the planning? Yes, very pleased from start to finish. They both made it very easy to plan the wedding from such a distance, they came up with many ideas that would not have crossed out minds and their attention to detail was first class. 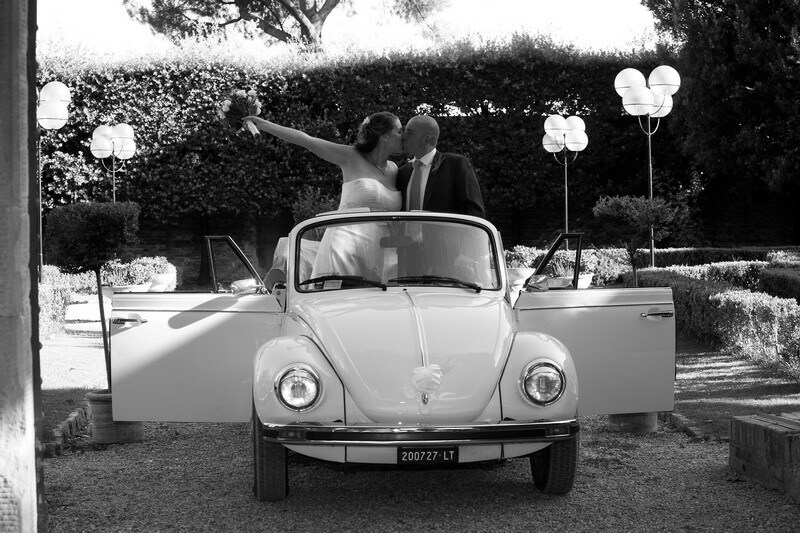 If you are thinking of getting Married in Tuscany rest assured you will be in safe hands with Erica and Nicoletta. Fantastic work guys – Thank you both so much !!! 11. 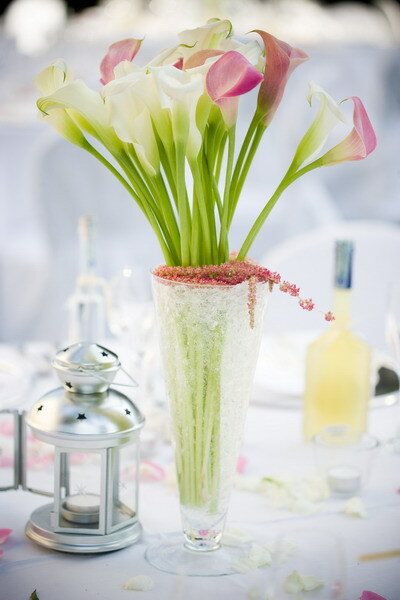 Colour scheme of wedding : FLOWERS - white and light pink calla lillies in tall vases. 1.How did you feel when you first met your husband? Dumbstruck by his handsome good looks and boyish charm (yes he ‘helped’ me write this). 2.When and where was your first date? We’d been friends for a while because we worked together. We first started going out after a night at a club in London called SoulSonic. 3.What’s your best memory or funniest story of your time dating? There’s been many funny times, too many to choose a particular event. 4.Tell us about the proposal – how did it happen? I was taken to New York for a surprise Christmas trip. He popped the question in a restaurant in Greenwich Village. YES! We’d been together for 11 years and we’d always said that we were happy together. We weren’t that fussed about getting married. 6.Did he go the traditional route and ask your father’s permission? No. Although I think he mentioned it to my mum. 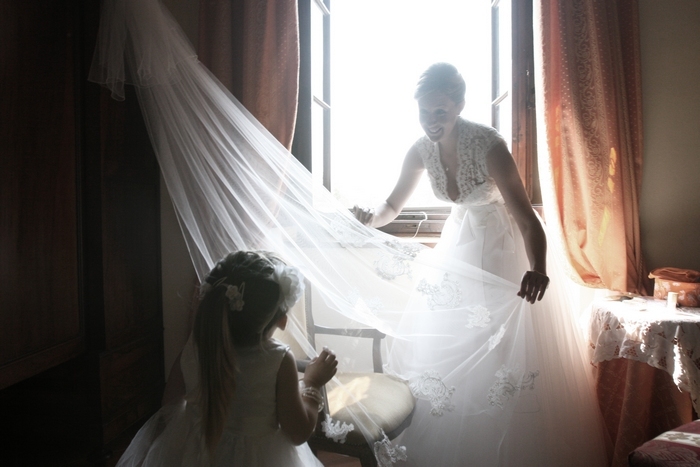 1.Where did you find your wedding dress? I purchased my wedding dress in a shop in Bromley called Marianne Jessica. I initially thought I’d find something on ebay. But this idea didn’t last long! In the end I brought the dress in a lovely little boutique style shop near where I live. As I was looking through the rails I knew I’d found the dress for me the second I clapped eyes on it. This completely blew my original ebay budget, but what’s a girl to do? 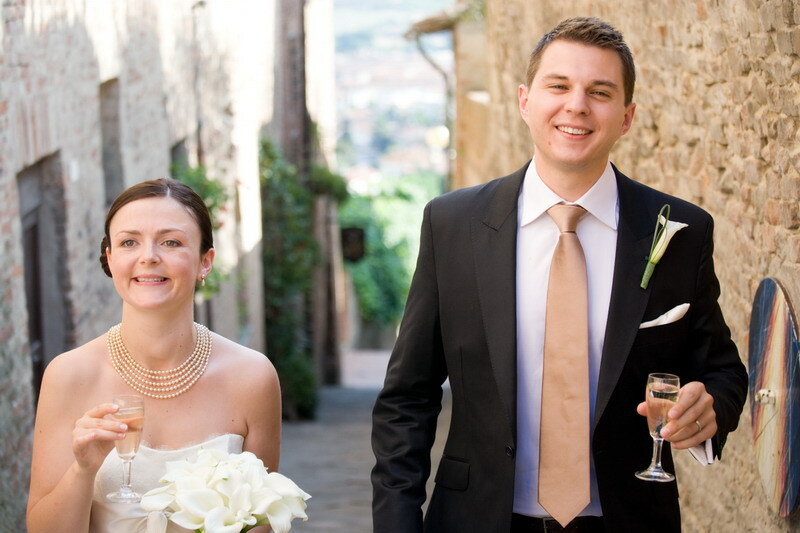 As I was getting married abroad in Tuscany it had to be quite light weight, with not too much material so it was easy to transport and cool enough to wear in the heat. It was a beautiful ivory strapless dress with a small train made from satin like material with organza over the top. It had delicate lace and beading on the edging of dress. And the bodice was rouched and finished off with a row of pretty flowers over one shoulder, trailing down the back of dress. It was from the collection from Augusta Jones called Kelly. 3.How did you feel when you put it on? I’d already fallen in love with it just from seeing it. When I tried it on it just confirmed what I thought. I loved it. 4. What accessories did you wear on the day? The dress was quite detailed so I didn’t want too many other accessories. I opted for simple studded pearl earrings, a corsage bracelet of flowers (which the wedding shop make up for me from my dress) and a few in my hair to complete the look. 5.Tell us about the – tiara, jewellery, shoes, underwear! 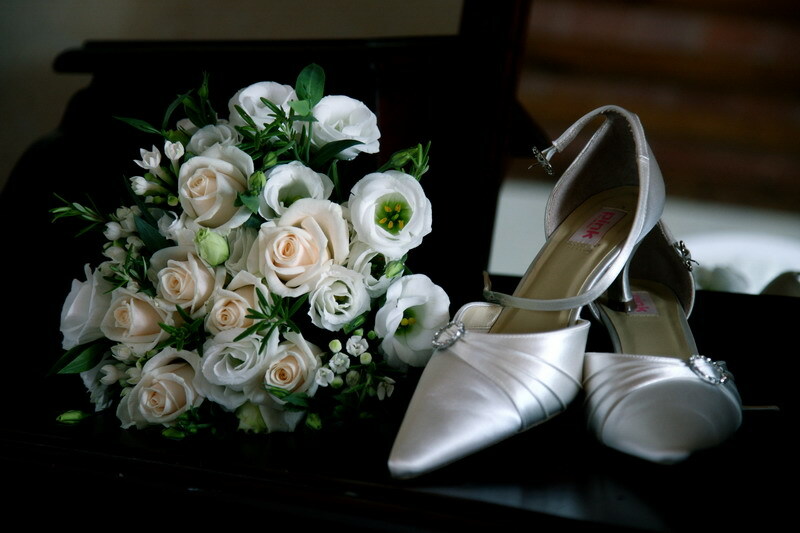 I was lucky to spot a pair of silver leather shoes in TK Maxx from the Paris Hilton collection as all the bridal shoes I’d been looking at looked were cream fabric which I thought were a waste as I wouldn’t get to wear them again. 6.Where did the groom buy/hire his outfit from? Yes. Being a typical man it was the first thing he tried on. At first I thought he was just being lazy. But when I saw him try it on, I had to agree, it did look nice. 9.How did he look when you first saw him? He doesn’t usually wear a suit so I thought that he looked really smart. 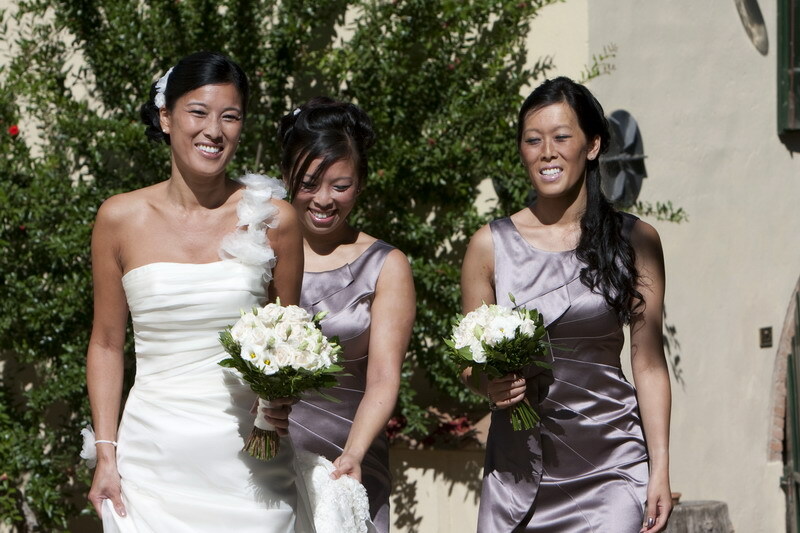 10.Tell us about your bridesmaids – how many did you have and who were they? 2 bridesmaids. My two younger sisters. 11.How did you decide who to ask? How did they help you? Easy really, as I’ve got 2 younger sisters so I asked them. I would have like to asked two of my other friends, too, but because there was only 30 guests, I needed to keep the numbers down so there would actually be someone there to see us get married. 12.Tell us about their outfits – where did you buy the dresses (boutique/designer/material/price/accessories)? 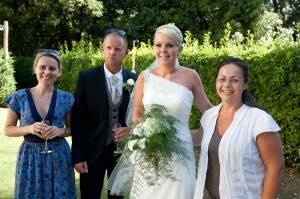 The wedding was in Tuscany, in summer, so I didn’t want them wearing something too heavy and restricted. I stared looking early in the January sales. We found exactly what we were looking for in Karen Millen and the shoes in Aldo. All with 50% off! 13.How did they fit with the theme? There wasn’t really a theme but we wanted brides maids dresses and groom/ushers to wear grey suits/ties. 14.Did you have any other attendants? Did you give your attendants a gift? We paid for a night’s accommodation for everyone so we didn’t spend much on presents. I bought my sisters some Selfridges vouchers. And the Bestman and Ushers got John Lewis vouchers. 1.Tell us about your make-up.. I opted for shades of brown. Nothing too fancy. Just an ‘upgrade’ from my day to day make up. 2.What brands did you use? Clinique quickliner for eyes brown/black eyeliner and Clinique Foxy 404 eyeshadow. 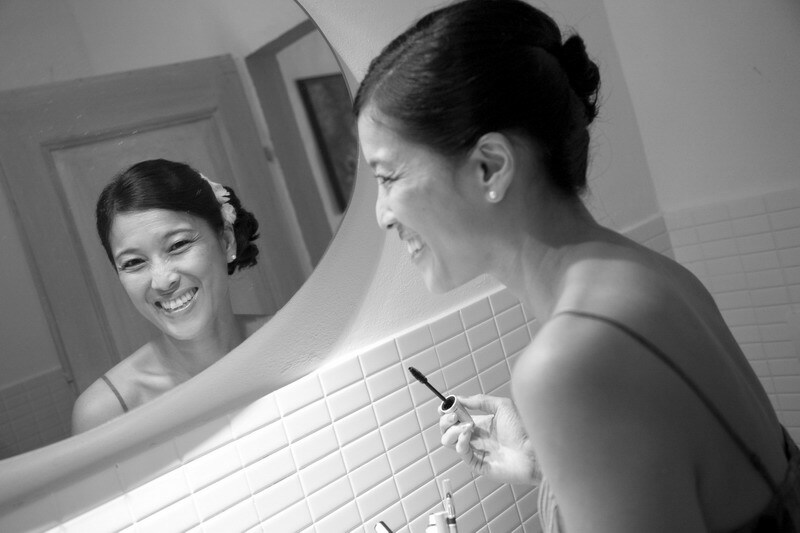 3.Do you have a make-up tip for other brides? Thought that I was going to be very tearful on the day so I did a test of a few waterproof mascaras and decided on Maybelline The Colossal Volume Express Waterproof mascara.Highly recommend it! 4. How about hair – did you and your maids hire a hairstylist? If so who, and what did she do? I knew roughly what I wanted and use the hairdresser that the wedding planners recommended. It was lovely for me and my friends all having our hair done at the same time, with a glass of champagne before the ceremony to calm my nerves. Mine was quite simple with lose curls in a bun put up to the opposite side of the train of flowers on my dress. I also had some flowers left over from my dress which I attached to hair pins and then they were put in my hair. The ceremony was a simple affair in the sunny grounds of an Italian castle ( Castello di Marcialla booked through Tuscan Dreams www.tuscan-dreams.com ). As neither of us are religious so we opted for a celebrant rather than a priest. 2.Did you have readings and/or music? We had my husband’s mum and our friend Mel do a reading. 3.Who walked you down the aisle? 1. How did you create your fabulous big day look? So tell us all about the suppliers you used. As I didn’t know how I wanted to get married it took us a while to come up with ideas. It wasn’t until someone at work said that they were getting married in Tuscany that I thought that could work for us seeing as we wanted a small wedding, outside in the sun, with tasty local Italian food. 2. What was your theme? 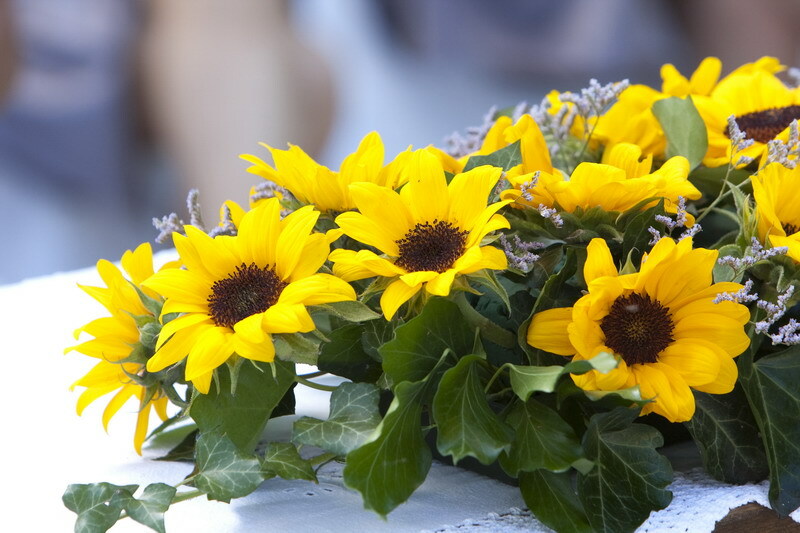 We wanted to use local flowers so there were lots of sunflowers and herbs for the table decorations and white roses and herbs for the bouquets. 3.Where did you get your stationery? My husband works for an advertising company so he came up with the idea. For the invites he designed a 70s style postcard to invite our friends to come on a ‘holiday’ with us. 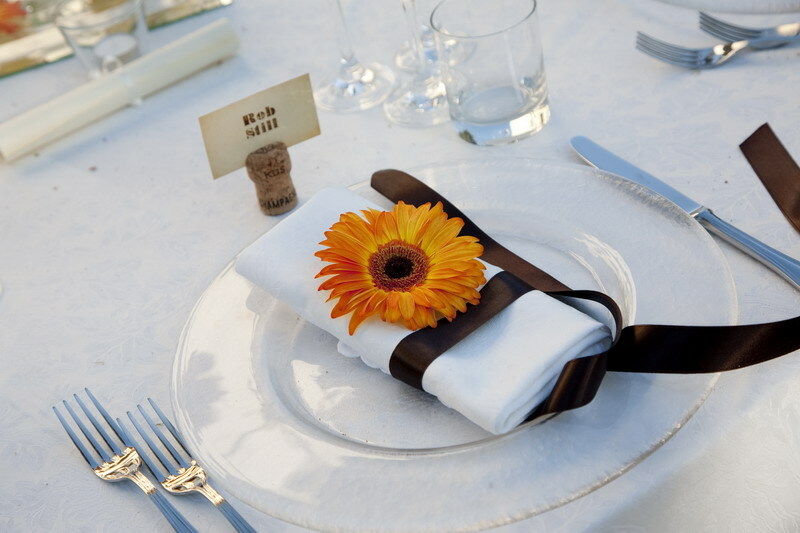 The table plan and order service tied in with our sunflowers theme we had on the tables. 4.What transport did you hire/borrow? No transport was needed as everything was under one roof. 5.What decorations did you buy and how did you decorate the venue? 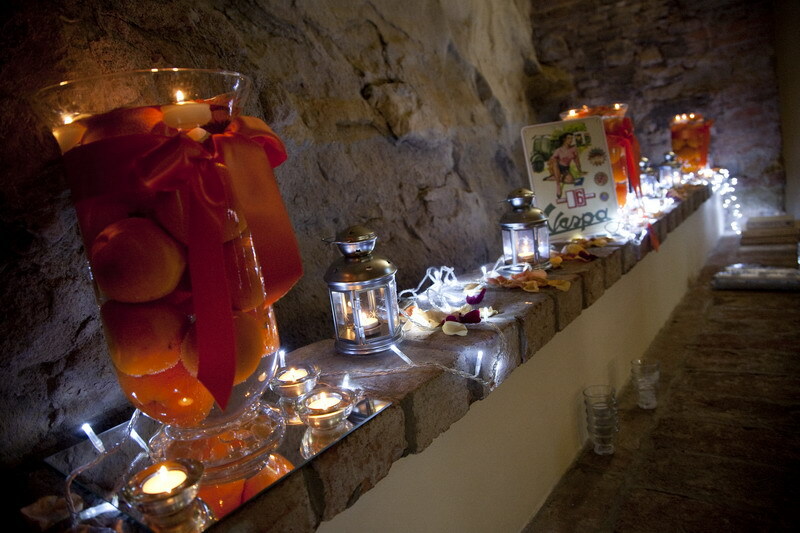 Tuscan Dreams did a fantastic job of decorating the venue with lanterns, tee lights, ribbons, lights in jars on bird hooks and waxed candle bags. 7. Were you inspired by any celebrity weddings? If so, who? If anything, seeing how some celebrities did it made us sure of how we didn’t want it to be. 1.Tell us about the reception – where was your venue? The reception was in the old castle where we were all staying. ( Castello di Marcialla booked through Tuscan Dreams www.tuscan-dreams.com ). 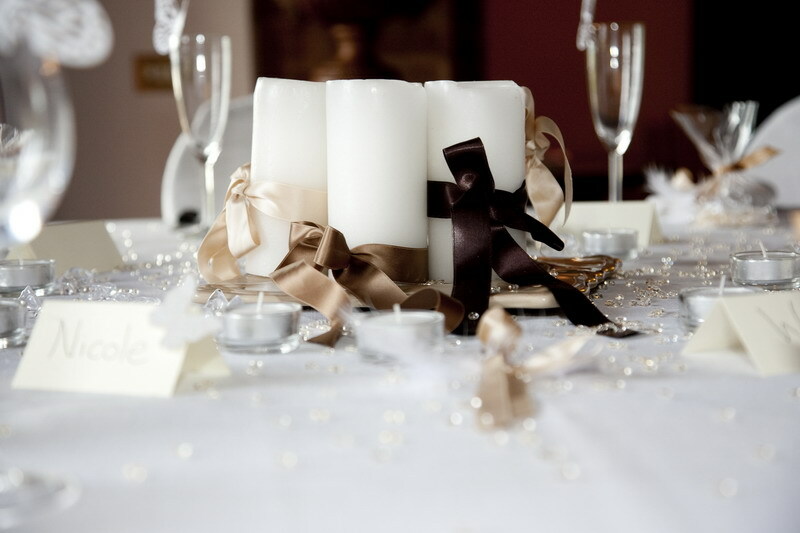 2.How did you do the table plan – was it a traditional top table? We wanted all our immediate family on the top table and then we just tried to spread everyone else out so they would be sat with people they knew. 3.How many people did you cater for? Did more arrive later? We catered for 30 people. 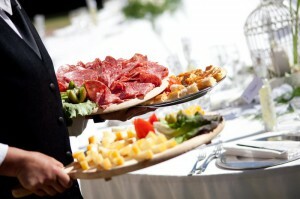 Canapes and Prosecco to start with after the ceremony and a hogroast meal when we sat down. No one turned up later. 4.Tell us about the speeches – what was memorable? What made you laugh/cry/throw plates?! We kept the speeches to a minimum. My husband did an amusing ‘Thank-you’ speech and his bestman was very funny. But then my husband is a bit of a wally, so he plenty of material to work with. 1.What was your entertainment – music/band/DJ? We had a DJ. But we gave him exactly what we wanted him to play. Wedding DJs can be pretty awful and especially in another country where we thought he might not speak much English. At first he was a bit reluctant to play our music but by the end of the night he’s liked it so much he asked if he could keep the mix we’d given him! 2. Tell us about the first dance – what song did you chose and why? Did you choreograph a routine? We chose a song by the French band ‘Air’. It was a song my husband used to play to me when we first met. Our dance was more ’school disco’ than ’strictly’. We hadn’t really thought about until about a minute before the song came on. 3. Describe your favours (if you had them)… were they different for male and female guests? The whole weekend was unforgettable. Close friends and family. Great food. Bright Sunshine and the beautiful Tuscan countryside. 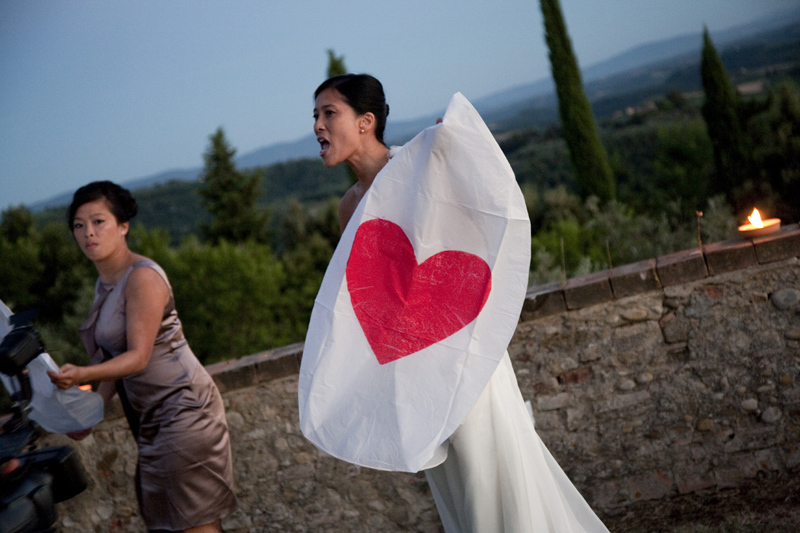 I can highly recommend getting married in Tuscany. And can highly recommend Tuscan Dreams. 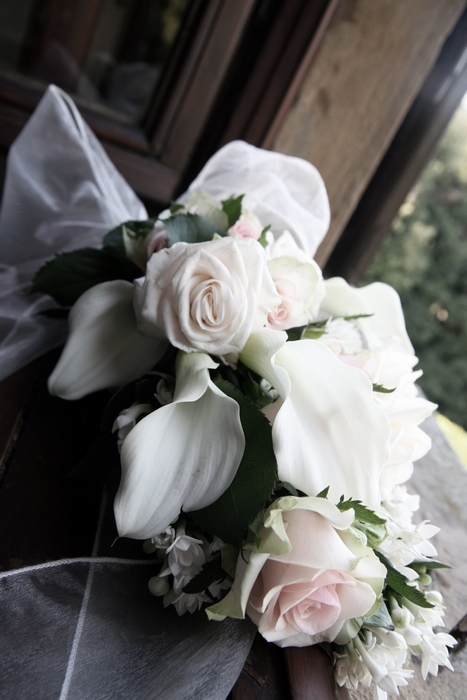 For brides - Keep it simple. Don’t panic. Enjoy it. If a little thing goes wrong, don’t let it ruin your day just have another glass of Champagne and go with the flow. 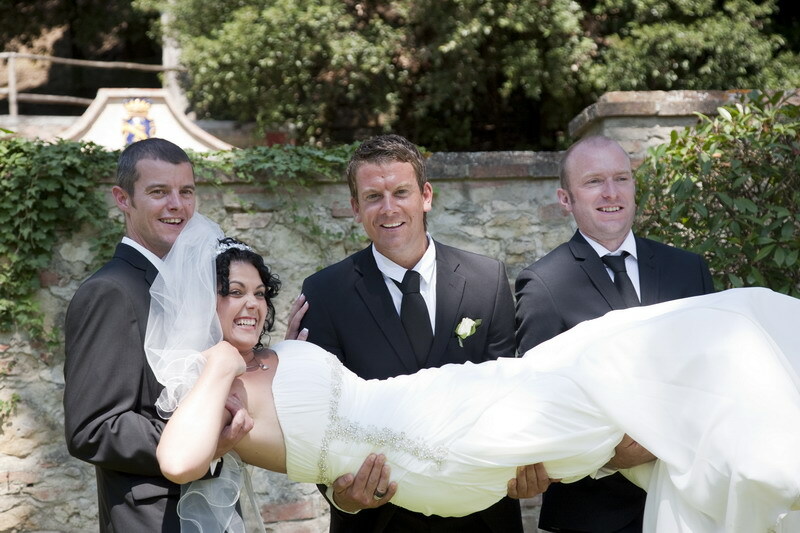 For grooms - Erm…pick someone you love. For keeping to a budget - Get married abroad. It’s a lot cheaper than you think. The food is better and there’s no corkage! “If we could do it all again, we’d…” wouldn’t change anything! 2.Tell us about the honeymoon – when/where did you go? what did you do? Profession : Matt – Operations Director of a Brick Distribution Company, Hannah – IT Consultant. We have been together for 8 years and there have been lots of fun times and exciting stories that have happened along the way….however the story of how we met is not all that exciting or glamorous but it truly was one of the best days of our lives. We went to high school together but being several years apart we never talked to one another.- and looking back it makes us laugh that we would have passed each other in the hallways hundreds of times not knowing that one day we would be married! In fact I think I even had a crush on one of Matt’s friends! 7 years later our paths crossed once more – this time in the delights of our local Cricket club for a mutual friend’s birthday. We got chatting and very soon we realised that we quite liked one another! So after one or two gin and tonics together and a lot of egging on from our two best friends (bridesmaid and best man) we decided to move on to our local nightclub for a dance! There we were on the dance floor busting some moves to Shakira when we had our first kiss! A very romantic moment! 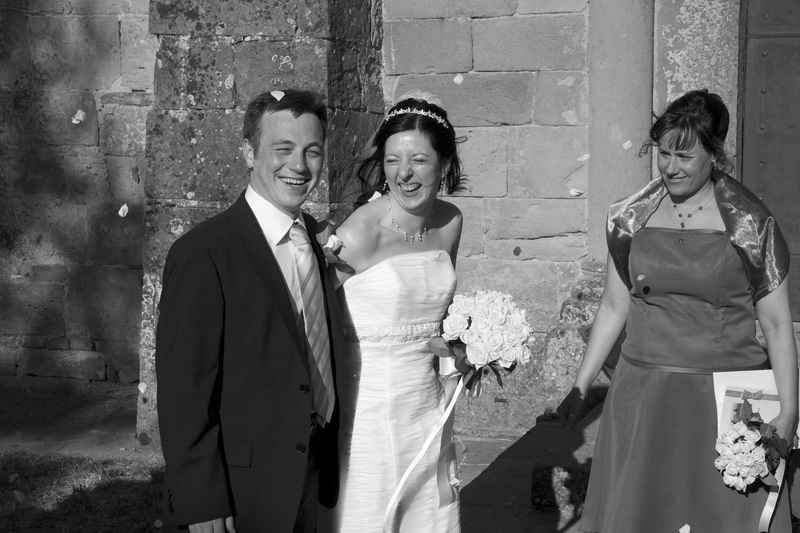 From that moment we were hooked on each other over the last 8 years we have had so much fun – enjoyed lots of holidays, great times with friends, buying our first house and having two adorable cats (who we treat like children!). Having seen so many of our very best friends get engaged and then married there was never a suggestion that we might be next - so when Matt did propose it did come as a shock to a lot of people (including Hannah) as he had never mentioned it to a soul! It was Christmas day 2008 - Matt loves Christmas and it seemed like the perfect most romantic time of year to propose. Christmas morning came – Matt was acting slightly sheepish! The bucks fizz was opened and we went into our living room to open our presents! Lots of gifts were exchanged – the usual – CDs, perfume, pyjamas! Thinking that was it for presents and about to start sipping my bucks fizz once more – Matt said I think there is one more present for you right at the back underneath the tree – not having the slightest inkling I found my present, ripped off the paper and to my surprise saw a jewellery box and I started to think ‘could this be what I think it is?’. Slightly nervously I opened the box and saw this beautiful shiny diamond ring looking back at me, Matt took it from me and then said ‘So Hannah I love you so much – will you marry me?” Tears were running down my cheeks uncontrollably having never felt so happy in my life – we were at home in the place we love more than anywhere else, sat underneath our pretty Christmas tree - I said yes gave Matt the biggest cuddle he said ‘why are you crying though –you are happy aren’t you?” I then started jumping up and down in excitement and he knew I was happy! It really was such a happy day and sharing the news with Family and Friends was amazing! People were so happy for us – it was the best Christmas ever and we had constant smile on our face. PROFESSION: Sam - Marketing Manager in magazine publishing, Lee Managing Director for AOP. HOW DID YOU MEET: Sam and I have been together 11 years, after meeting at the Guardian newspaper where we both worked. Our drinks together after work became more and more frequent, and soon we were a couple. Our first time away together just happened to be a work trip to Rome, that would start another love affair with Italy. HOW DID HE PROPOSE : Neither of us were particularly inclined towards marriage but, ten years later, neither of us could really remember why! So, on a ski trip to St Anton, Austria, I proposed to Sam in a champagne ice bar halfway up the mountain slopes. When we first entertained the idea of an Italian wedding, we never thought we would be able to encourage all our beloved friends & family to travel with us. 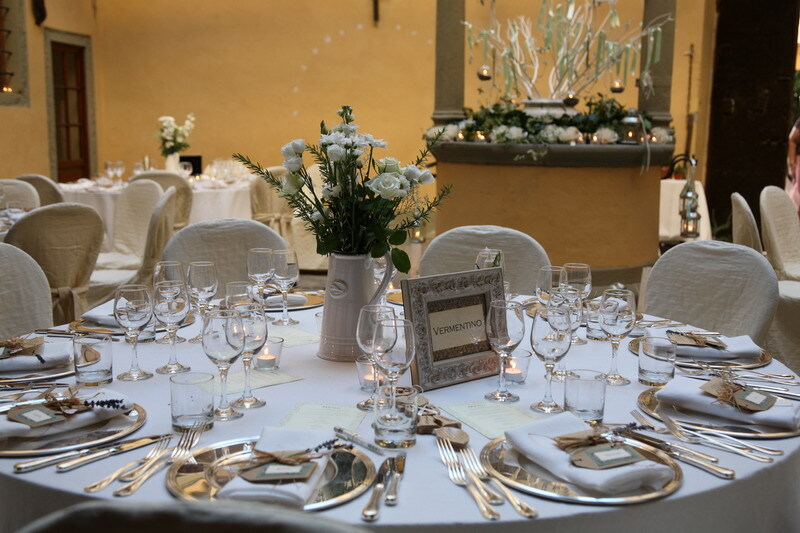 When they all whole heartedly supported the idea, the next piece of the puzzle was finding a location - something that our wonderful wedding planners at Tuscan Dreams were able to help with, and much more besides. We had the wedding of our dreams with all the people we love around us, and all the details and touches that made it unique to us. WHERE DO YOU COME FROM: We live together in Bournemouth but originally Carla is from Chepstow, South Wales and Ben is from Dartford, Kent. 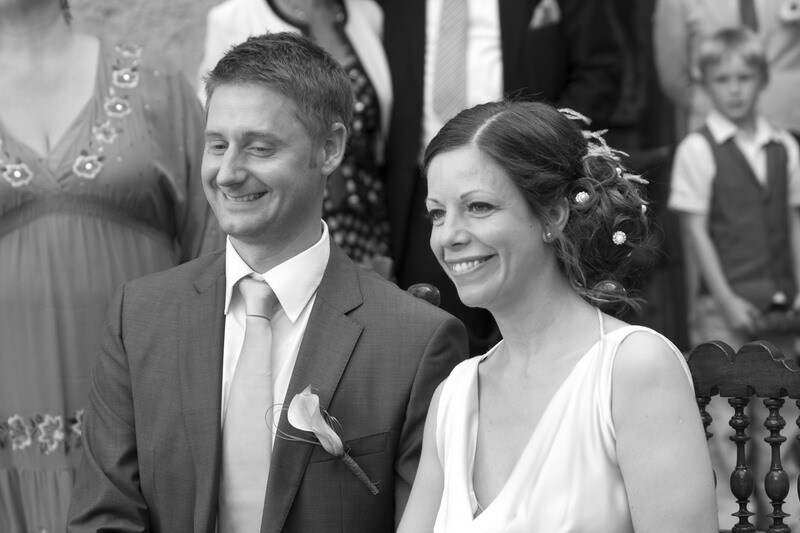 HOW DID YOU MEET: We met in 1998 at Bournemouth University. We were close friends throughout our 4 years courses and remained friends once we graduated in 2002. We finally got our act together in August 2004 and confessed our feelings for one another and started our relationahip! HOW DID HE PROPOSE: Ben proposed in May 2009 on Sandbanks Beach, Dorset. We had finished work, it was a beautiful sunny evening and we went to the beach for fish and chips! Ben pulled out a bottle of champagne and a little box with my beautiful ring inside. 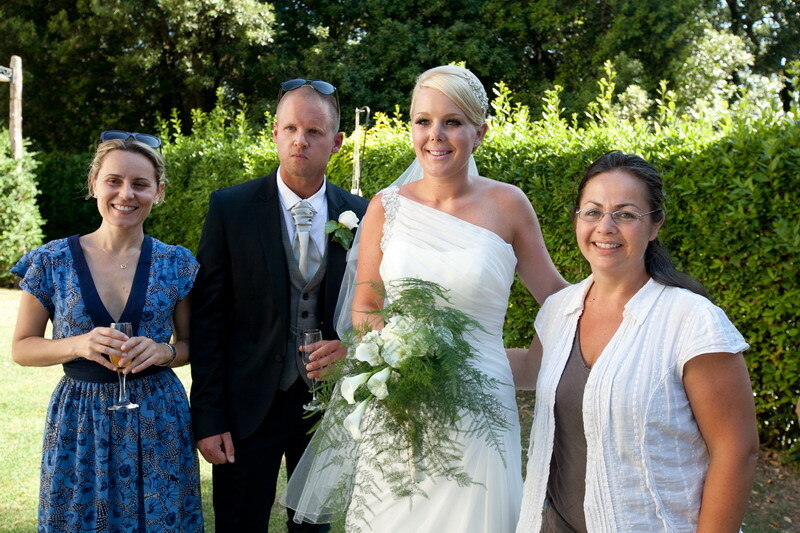 Carla and Ben got married in Castelfiorentino Town Hall on 11th September 2010 and had reception at Castello di Marcialla where they and their guests stayed. At Phil’s brother’s wedding in 2003. As a surprise, Phil took me to the Landmark Hotel in London – my favourite hotel. He then took me to the diamond shops in Hatton Garden and New Bond Street, followed by a romantic dinner later that evening. We chose my engagement ring at Boodles on New Bond Street. We both love Italy and liked the idea of hosting our closest family and friends at a beautiful villa in Tuscany for the weekend. When we found Villa Gambassi, we just fell in love with it and knew it was perfect for our numbers and budget. 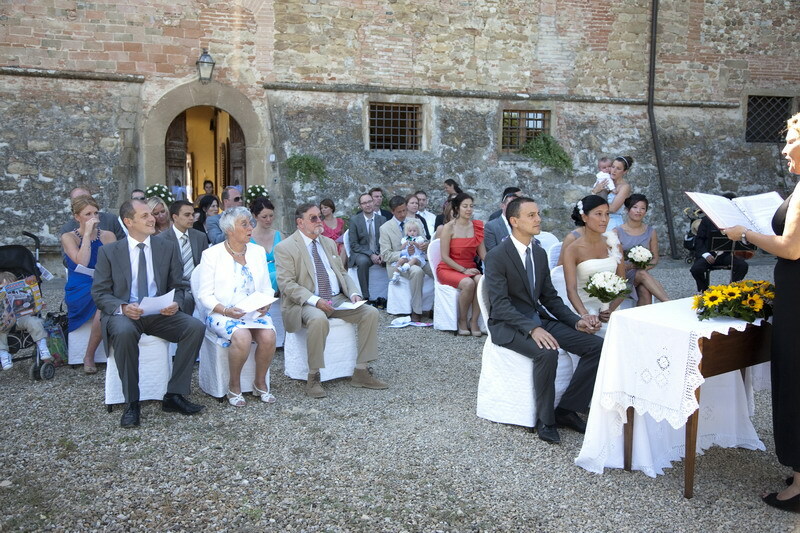 The Church – Santa Maria a Chianni – was even more perfect and meant that our guests didn’t have to travel far for the ceremony. 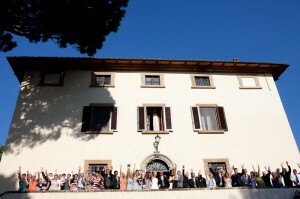 We researched the whole of Tuscany but always came back to Villa Gambassi. It ticked every box. 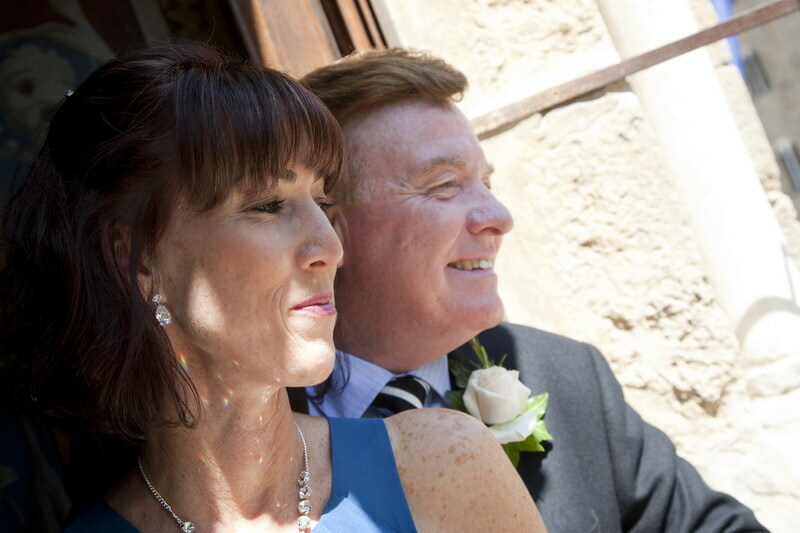 Our wedding planners, Tuscan Dreams, were so helpful and lovely and we just knew everything was right. No. It was perfect in every way. Always keep to your budgets and research the market. Vintage, Lace, Fine Art, Classic. Harpist during drinks, Disco in the evening. 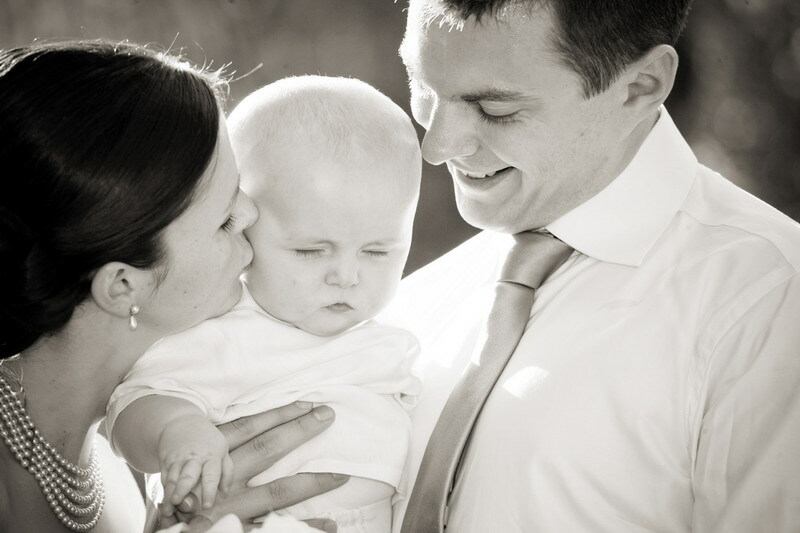 Profession: Steve - Business Travel Consultant, Fiona - Buyer – now full time mum! We got talking at a Christmas night out in 2001. Surprise proposal whilst walking along the beach at Findhorn Bay, Scotland. We decided to have a small and unique wedding abroad, we had been to Italy numerous times on holiday and love the country. 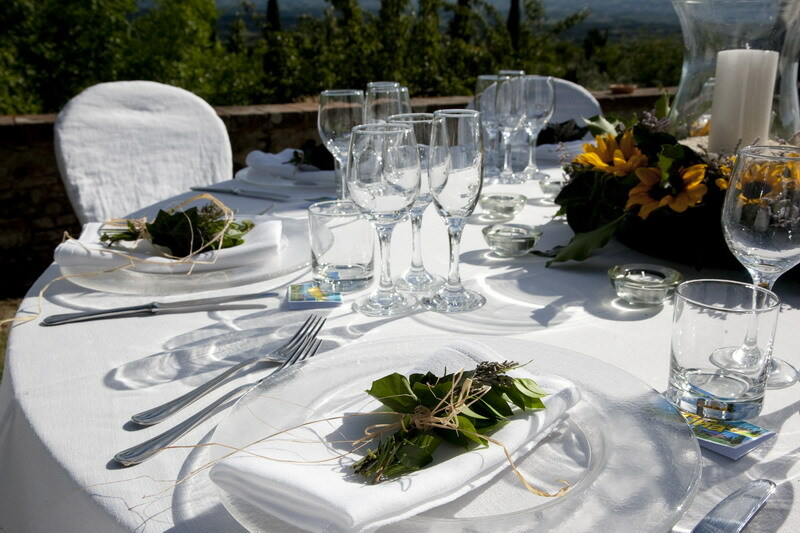 Having searched the internet for a wedding planner Tuscan Dreams (www.Tuscan-Dreams.com ) were extremely helpful and arranged for us to view various venues. 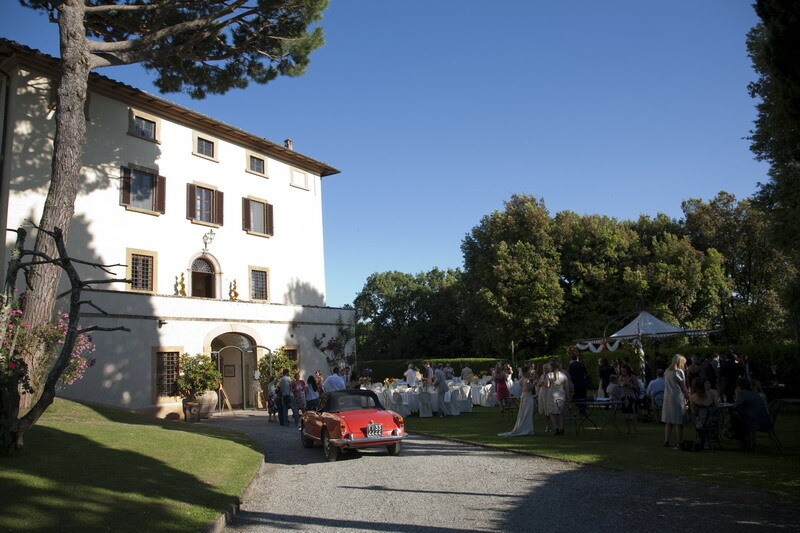 We decided on our venue – Villa Gambassi as soon as we saw it. 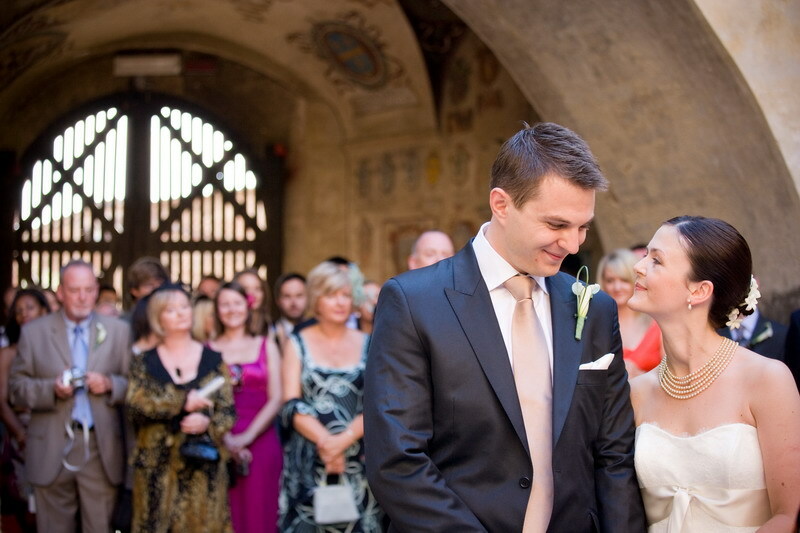 The nearby church suggested by Erica & Nicoletta was the ideal venue for our religious ceremony. For the religious ceremony there was a lot of paperwork to be completed In the UK and Italy. 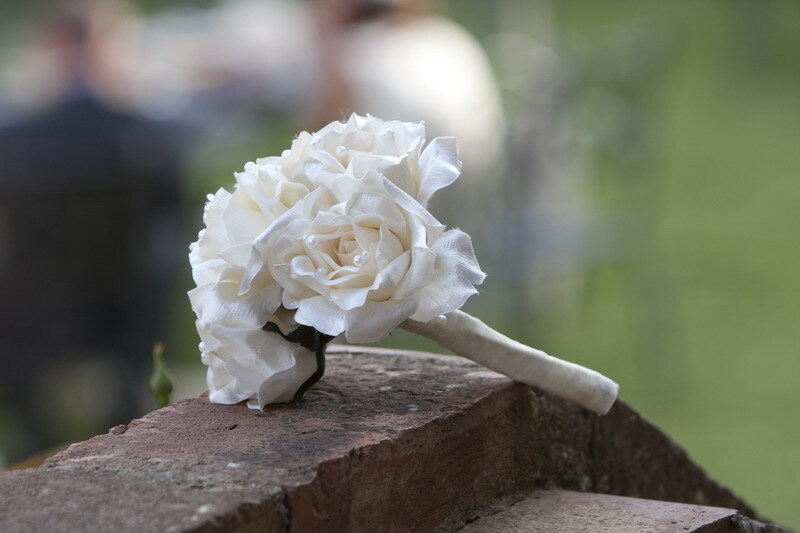 We used the internet and wedding magazines to research flowers, favours, dresses etc. Erica & Nicoletta were invaluable at offering suggestions and options. We had 24 guests in total. Favours, Place cards, Order of Service, Invites & Thank You notes. The hire of the villa for one week for all of our guests – well worth it to have such a memorable week with our family and friends! The whole wedding, the food & drink is more reasonable than the UK. Plus for the same or less cost we were able to enjoy a week with our family and friends instead of a few hours. We also saved money doing our own stationary. 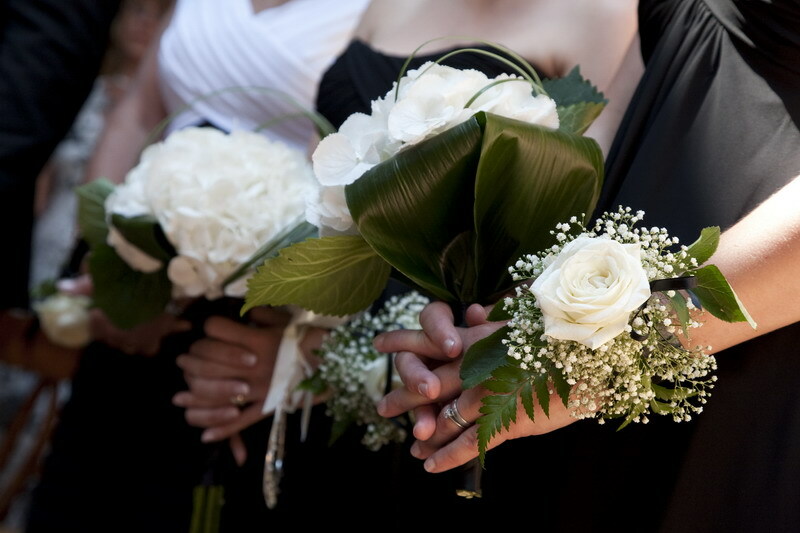 10.What advice would you give to someone planning a wedding? Try to keep calm and enjoy the planning. 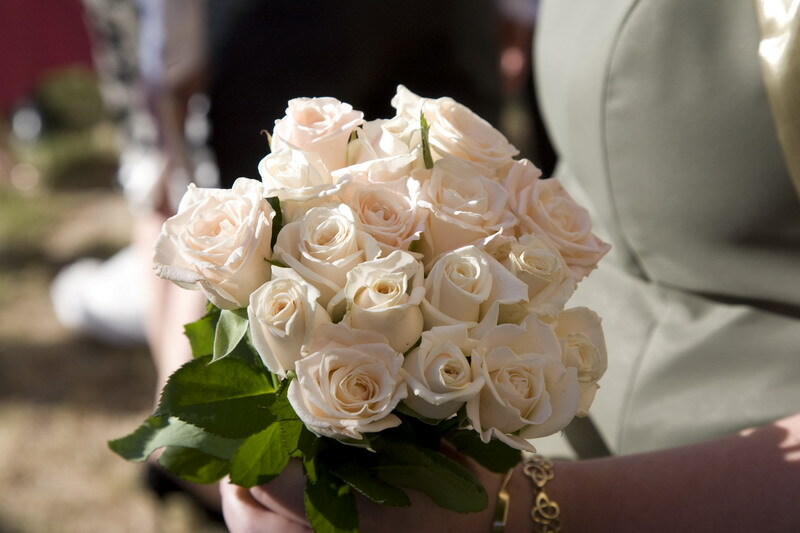 Trust your wedding planners advice - they certainly know their stuff!. Finally enjoy the day - it goes far too fast. 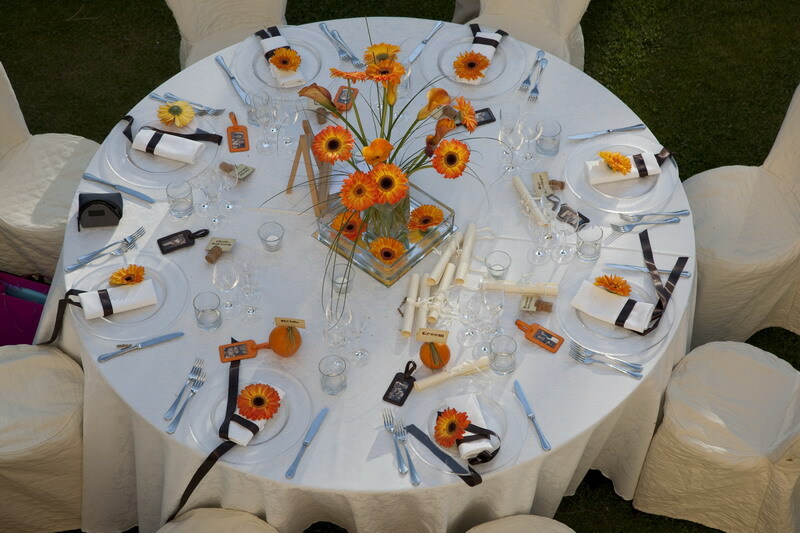 We wanted the theme to reflect the Tuscan countryside; Cream, Gold and Chocolate Brown colours on the stationary. 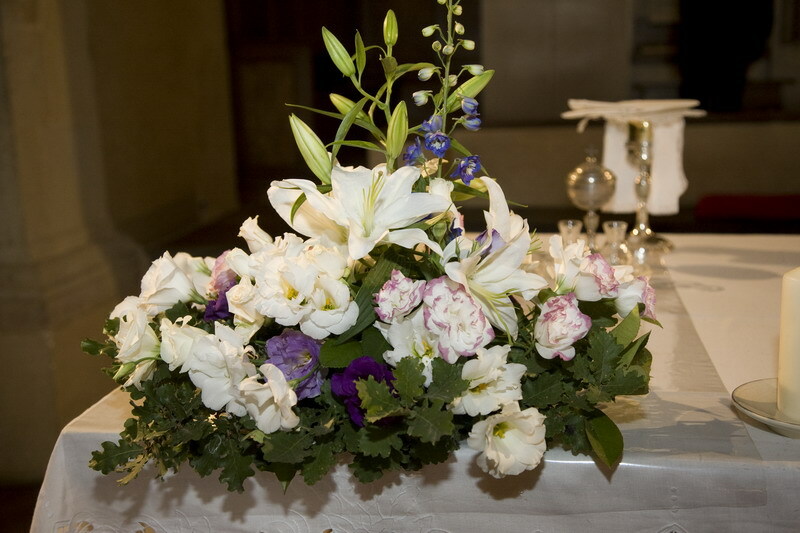 The flowers followed the same rustic theme – lavender on the napkins and country blooms in the church. For the favours we used traditional scented soap from the nearby village for the girls and a little bit of Scotland for the boys In the form of whisky. Bridesmaids were in Sage green. The music was brilliant! another great recommendation from Erica and Nicolleta – a special thank you must go to Lorenzo who played the organ in the church, violin during aperitifs and the keyboard with the band later on which kept everyone dancing until 2:00am. We were looking for somewhere different and special, somewhere where most Australians would not think of. Lots of research using the internet but mainly relied on Nicoletta and Erica from Tuscan Dreams to make the arrangements. As we had to travel half way across the world nearly everything was bought except the owner of the villa we were staying in brought roses from her garden on the day of the wedding. Lunch/dinner on the veranda of the Hotel Le Fonti overlooking one of the valleys of Tuscany which went for about ten hours, had nine courses and cost about 1000 euros. By using Tuscan Dreams to arrange nearly everything we needed for the day. Only try and have more friends and family there. Use Tuscan Dreams, they were terrific and I doubt that we could have arranged everything without their help. Also don’t cut corners for the day as you may only do it once in your life. 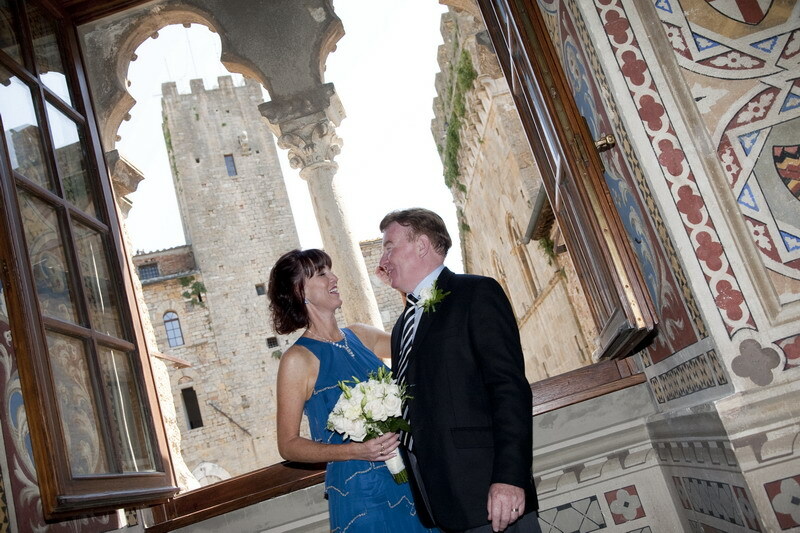 The theme of your wedding: The theme was Italian and our invitations featured scenes from the town of Volterra, outfits were blue to make the blue Tuscan skies and the atmosphere remained relaxed and informal. Music/entertainment: We had no formal entertainment but the Maitre at Hotel, Francesco was amazing to watch as he served the meals, told us about the food, decanted the wine and gave us a detailed background on the wine. He made our celebratory lunch/dinner an extremely memorable occasion. We attended the same high school and became good friends. A couple of years after we left school we got in contact again. We had both recently just broken up with our partners and it was nice to speak again after so long . We had a couple of dates and felt so comfortable with each other the rest is history. 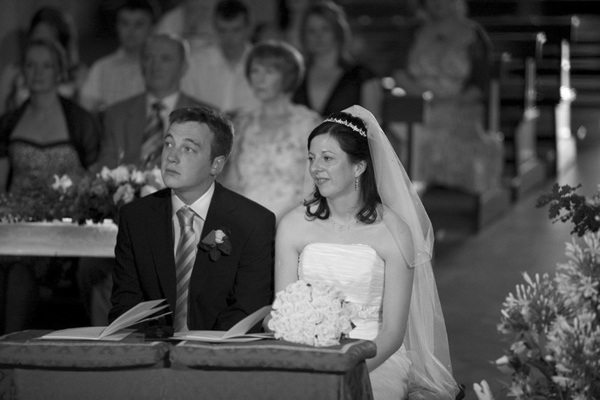 22/06/2010 – After we booked the date we actually found out that it fell on the same date as family history, such as Matt’s grandma getting married etc. 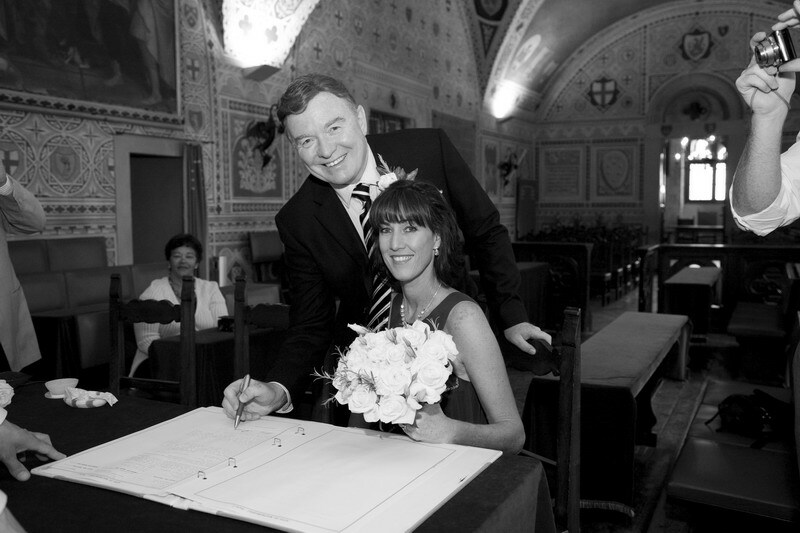 We got married in the Siena Town Hall, a beautiful location inside the famous square. 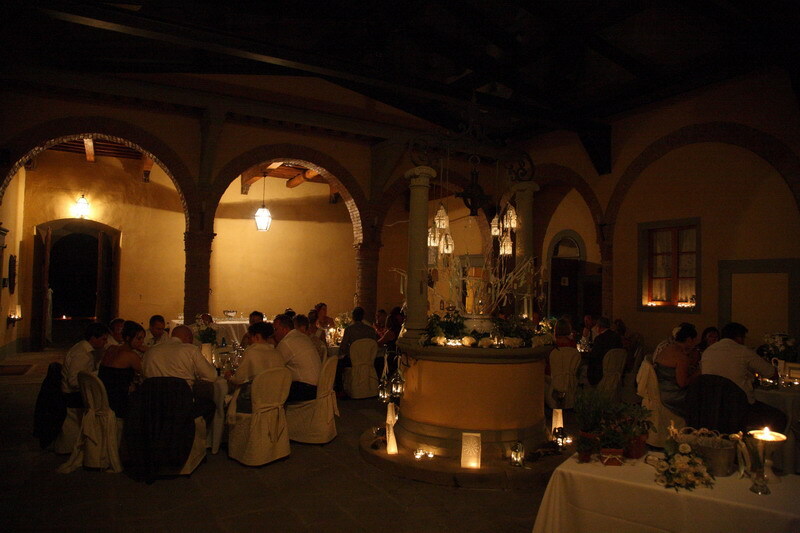 Followed by a reception back at our villa “San Galgano”. This was set next to the famous roofless abbey. 4. Why did the venue appeal to you? 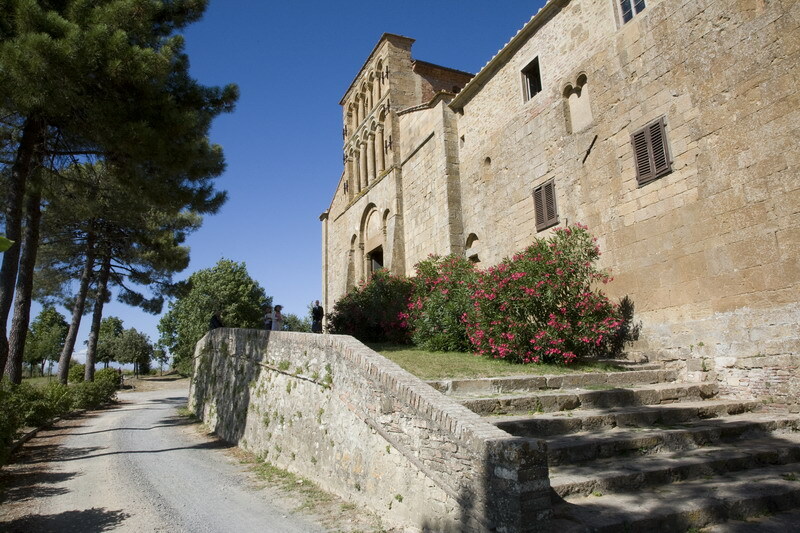 We visited the abbey with Tuscan Dreams the year before and we fell in love with it. 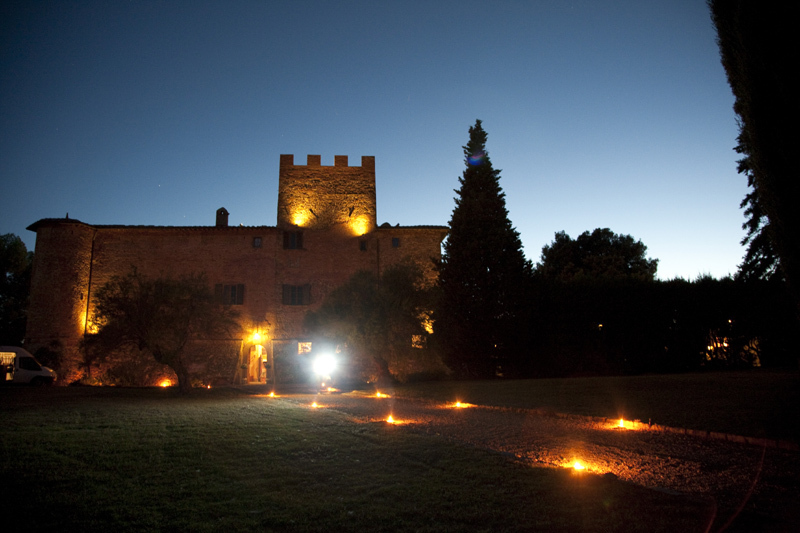 Villa San Galgano is an authenic Italian house surrounded by the most breath taking views of San Galgano abbey and vineyards. The house is non other than spectacular. We knew this was the perfect setting for our big day. We kept our colour scheme “neutral” Adele wanted creams, golds and browns throughout. 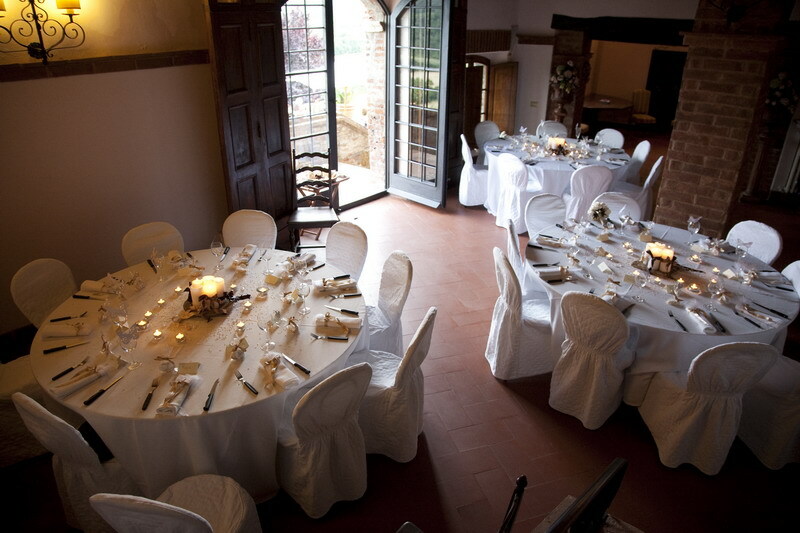 Our photographer was arranged through Tuscan Dreams and he did a fantastic job and made us feel very comfortable. All flowers were cream roses, we had small posies as we wanted the main focus to be the dresses and also the lace parasols. 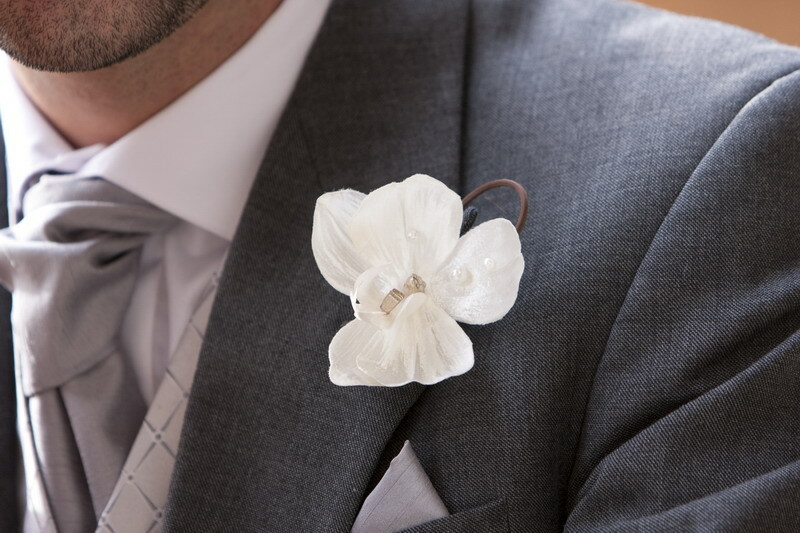 Groom, farther of bride, father of groom and best man had a single orchid. Mother of bride and mother of groom also had pearl dressed orchids. We had a harpist for the ceremony she was amazing, that alone made me tearful! in the evening.. again we had most of this side at our party back home. In Italy we kept it all very relaxed, after the wedding breakfast and speeches we had music flowing through the house and drinks galore! 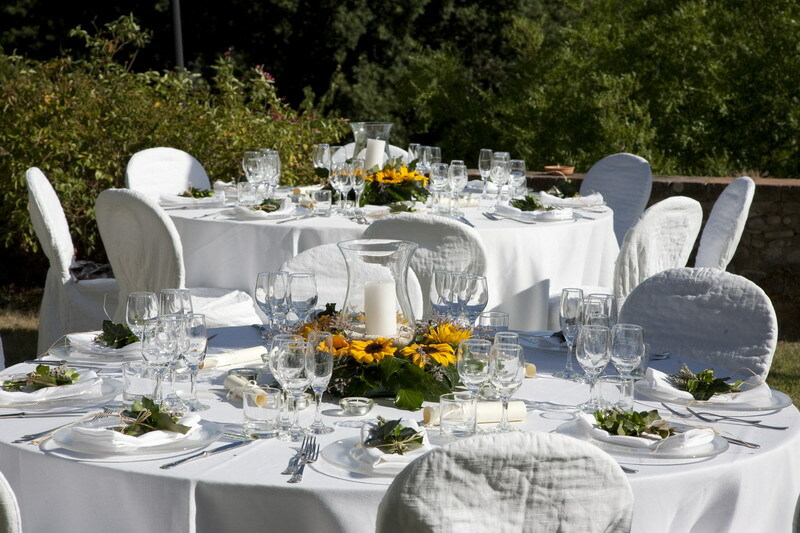 We had three round tables all dressed in cream linen and chair covers. 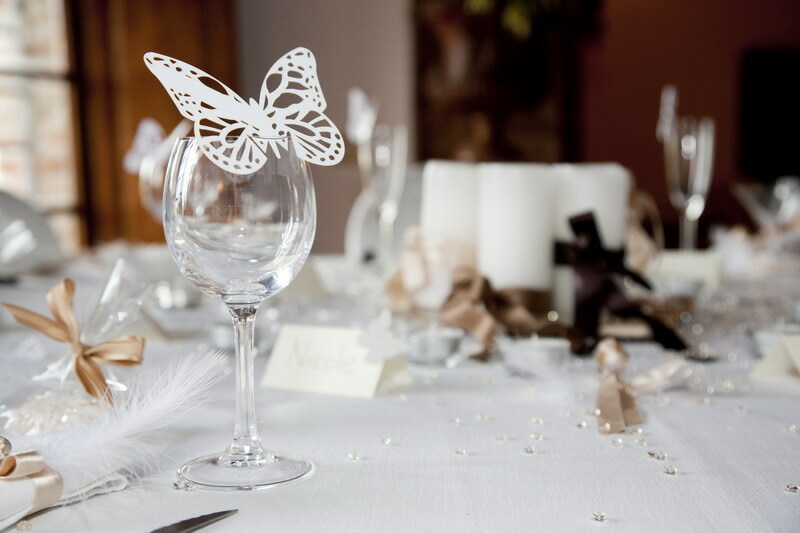 We had a butterfly theme on the tables, our name settings had little butterflies and we had butterflies sat on everyone’s wine glasses. 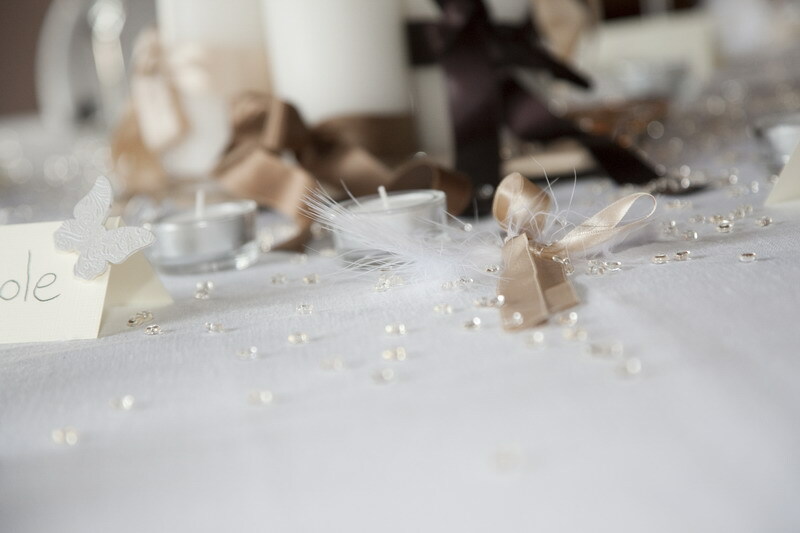 Erica had dressed the table with golden feathers and gorgeous gold crystals. The centre pieces were three church candles on a Italian crockery, the candles were tied with gold, cream and brown ribbons. The room was covered in candles and tea lights! Just as we had dreams. 1. 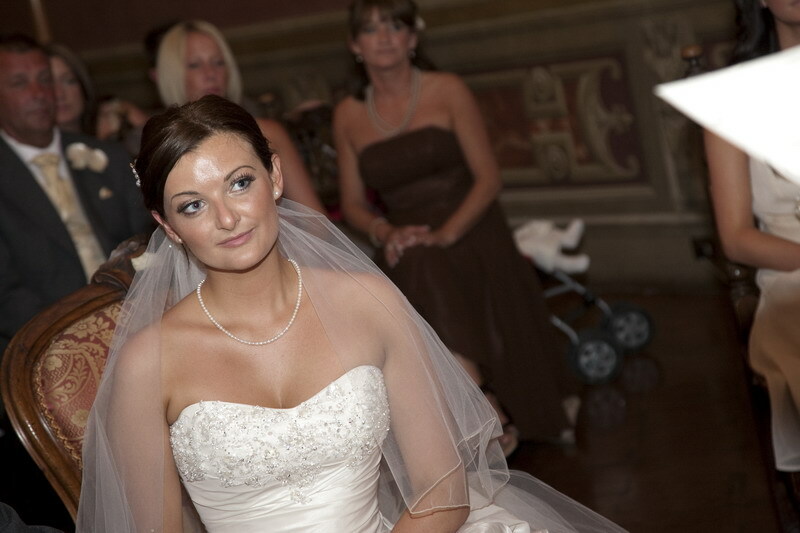 Wedding dress designer: My dress was by Maggie Sottero it is called Sabelle. My dress was a gift from my wonderful mum. 2. Where did you get the dress from? My friends mother works for Maggie Sottero so I knew I wanted one of her dresses, they are so beautiful! I went to Arisacrats in Chester. 3. How did you know it was ‘the dress’? I wanted a fish tail all lace dress…that’s what I was hoping to find! The moment I stepped foot in the shop me and my mum saw it and said..yep that’s the one! Although it seemed crazy to have such a heavy dress to take abroad I just had to have it! so we just booked an extra seat on the plane for it! it was well worth all the hassle…but never had I seen a dress have its own boarding pass. Very funny. 1.What was your best idea? 2. What did you really love on the day? For me it was walking down the aisle towards Matt, it was so emotional seeing him stood there. 3. Would you do anything differently? The only thing that we would change was the time we got married, we got married at 4pm and it just seemed to go so fast. I wish we had got married slightly earlier…then maybe we would have avoided that 10minute drizzle when we left the town hall too, but we are told that is good luck! 4. Did you make anything yourself (favours, stationery, etc.) – please can you explain how you made it/them? We went to a company called inspirations for our place settings etc we put them together but it was only simple things. 5. What are your money-saving tips? You can save so much money by making your own invites. I would just say to agree a budget and add a few extra hundred…because there is always that something extra that you just HAVE to have! Cuba!!! Matt has always wanted to visit Havana…and I am always happy as long as I have sun, a good book and a cocktail! Finally, is there anything else you want to tell us about the day? 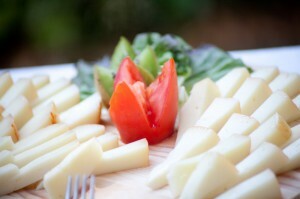 We just want to mention how fantastic our friends and family were along with Erica and Nicoletta from Tuscan Dreams. We couldn’t have done it without them!